Candy corn + vodka + one week = an oh-so classy (ha) liqueur that’s perfect for the season. And also perfect for getting that dang hard-to-resist candy corn out of your sight. 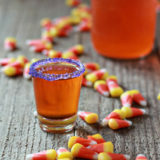 This one belongs in the so wrong/so right files, and I fully admit candy corn infused vodka lies very solidly on the “so wrong” side of that equation. If you’ve been following my blog for awhile, you may have noticed that most of my recipes call for fairly whole foods – sometimes healthy, sometimes overly cheesy and definitely not so healthy – but almost always real. And then there are recipes like this that I just can’t help but sprinkle into the mix every now and then. It’s not whole, it’s not real … but hey, it’s not cheesy. At least not cheese of the dairy variety. Silly cheesy, well. You got me there. Hey, sometimes you’ve just gotta have fun with totally-wrong-for-you foods. Right? 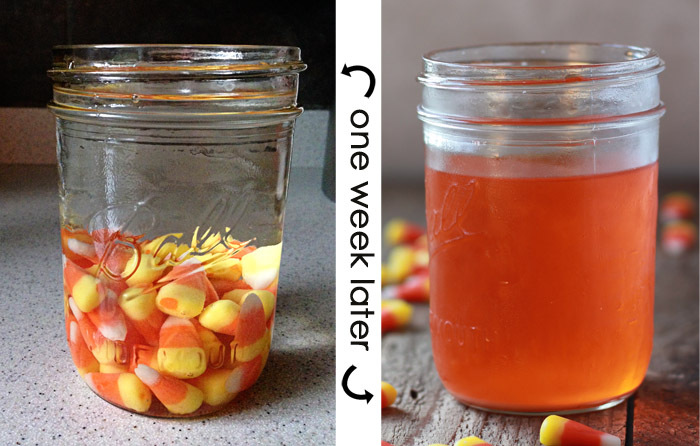 Here’s how Candy Corn Infused Vodka came about. See, on a whim, I bought a bag of candy corn. And then I couldn’t control myself around it. So I squinted at the candy dish thoughtfully, eyed the mason jar next to it, and peered up at the liquor cabinet. 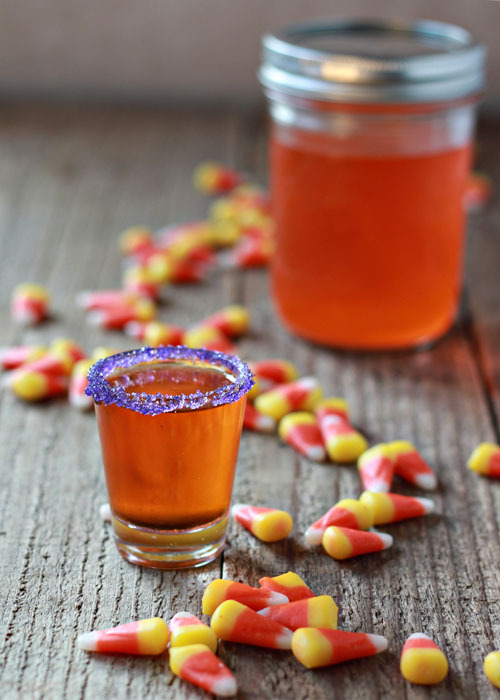 Candy corn vodka. It was happening. 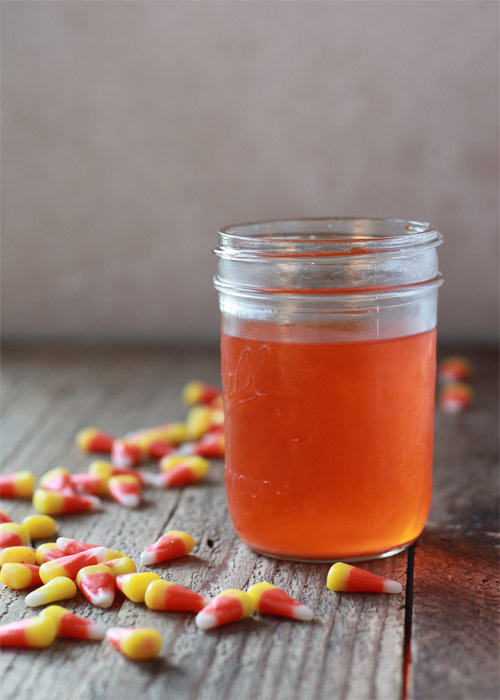 I’d finally check “make a candy-infused liquor” off my bucket list, and I’d get those last few dastardly candy corns out of my sight (and tummy) for good. I put 1/2 cup of candy corn in the jar, and poured in 1 1/2 cups of vodka. I sealed it up and put it in the cupboard, shaking it every day or two. After a couple of days, the candy corn was all but dissolved, but I let it sit for a full week. Then I strained it to get the remaining candy corn particles out of the mix, and chilled it. And then we drank it. 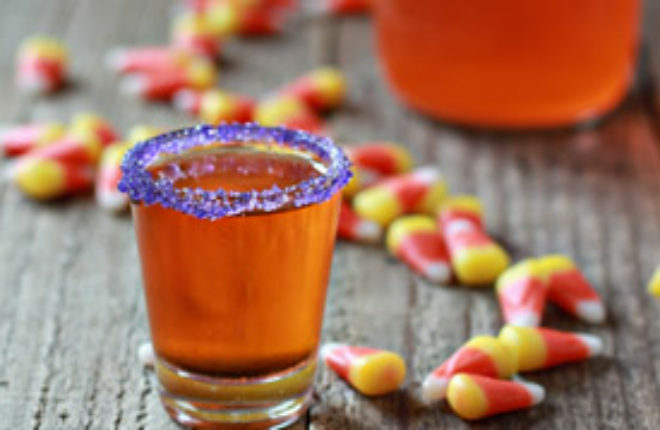 Candy corn vodka might be good mixed in with some other stuff (Halloween-themed Vodka Collins, perhaps? A Candy Corn Martini? ), but we didn’t try that. We just served it straight up in shot glasses. But we didn’t just down our candy corn vodka, oh no no no. We sipped it, not unlike one would sip a fine dayglo liqueur. It … well, I have to say it’s not vodka transformed or anything. It basically tastes like … vodka. And candy corn. Together. 50/50. Which is a pleasant combination, we think, but not life changing. But, hey, it’s totally fun to infuse candy with vodka, and it’s perfect for Halloween, and it really is the most awesome artificially-colored orange vodka I’ve ever seen. So, you know. Every once in awhile – why not. Note: I had to buy another bag of candy corn for the photo shoot. And now I have a darn stomach ache. Add candy corn to mason jar. Pour vodka over the top. Seal and place in a dark cupboard or pantry for one week, shaking occasionally to help distribute the solids. Pour mixture through a fine-mesh sieve to discard any solids. Chill if desired and serve straight up, or any other way you dream up. This is an amazing idea! I am totally doing this. Thanks for the creation. Never in 100 years would I have thought to do this. Ingenious! Such a fabulous cocktail for Halloween!! How many carbs are in this?